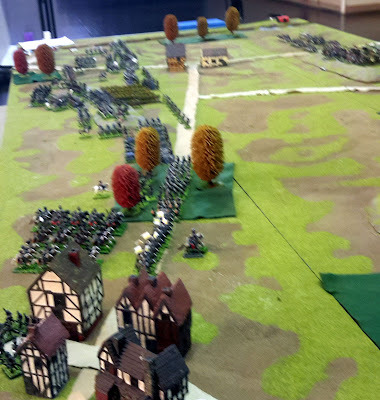 This was a Blackpowder game to get more club members familiar with the rules for future games and this is the 200 anniversary of Napoleons last campaign before his first abdication. This is a very interesting battle, Napoleon's forces are almost excursively the Imperial Guard vs an inferior Russian force. Our game was a hard fought action, while the Russians suffered heavier losses than the French, the French had not broken through the main Russian line and even if they had there was still enough Russian troops to form two more battle lines and the Russians had only committed one Hussar and one Cossack regiment, they still had a Cossack Division, a Hussar Division and a Dragoon Division as well as 3 Infantry divisions in reserve (all under the command of our own General Nathan). It was not an action the French were going to win. The 21st Division behind the centre and behind this division the 12th & 13th Divisions and the cavalry. The Russian right around Paissy under Benkendorf. The Cossack Division to the left of Cemy. The cavalry was under Wassilitchkov. The Hussar Division and the Dragoon Division to the right of Cemy under Wassilitchkov. A brigade of the 15th Division out on its own forward of the main line in the centre (where is the second brigade), maybe they should be in line. The French 1st Young Guard Division arrives, massive. 2nd Young Guard Division and 9th Corps arrive, big. The French are poring through Craonne, who knew one small town could be so magnetic. The Young Guard making their way towards the Russians. The Young Guard start deploying their battalions to take on the lonely 15th division (looks like the 15th is about to make a lot of new friends). The French advancing very quickly, run rabbit, run rabbit, run, run. The French have deployed in the centre, what will they do, wine and cheese time. Two Russian Jaeger battalions have advanced to hold up the French advance (looks like their generals horse has had a heart attack). The Russian 13th Division with the 2nd Hussar Division in support, wait for it. The Young Guard looking to take on the main Russian line (where is the Old Guard). There is still one Russian battalion holding out (the other 3 had left for good) are there is the Old Guard. The Old Guard Division has arrived, yeah?? The French are having trouble with just two Russian battalions, when two is twice what is needed. Russian 3rd Dragoon Division waiting to advance, there is this lovely hill to the left boys, just right for a picnic. The French pushing hard against the 14th and 24th Divisions, these Russians have charged the French, give it go lads. The Old Guards attacks, because the Young Guard failed? The Russian right is coming under great pressure, still the 9th Corps is moving slow. Contact on the French Left lots of casualties. More French forces pouring in, but to late. We ran out of time to complete this game, only two of the players know the rules very well and fewer players took part than was first thought would be there. We will give this one another go, hopefully with more players. Labels: 28mm artillery battalions Dragoons French General Grenadiers guns Minifgs Napoleonic Russian Russians. Nice report on your game. Glad to see the classic 25mm Minifigs in use. Great game as always! Great piccies mate.